The words we all hear, say and repeat hundreds if not thousands of times as data professionals. Whether at conferences, on webinars or in meetings, keywords like Blockchain, IoT, ERP, Migration and more pop up everywhere, so Team Utopia decided to have a little fun with it. 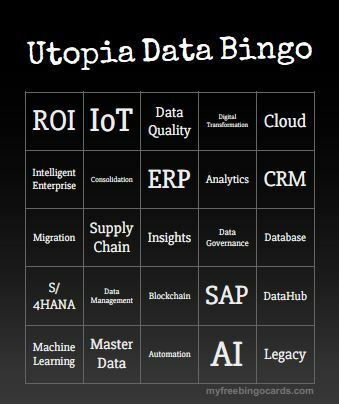 Introducing Utopia Data Bingo! Click the image below to download a template with 30 unique bingo cards filled with all of our favorite data words. Get the team together or use as an icebreaker before your next meeting!